Samaritan’s Purse will fly once again to the beleaguered island of St. Martin on Wednesday, and this time our DC-8 cargo plane will be carrying 30 tonnes of high-energy biscuits to help residents faced with dwindling food supplies. The World Food Program donated these biscuits to us for our Hurricane Irma relief effort on St. Martin, and our DC-8 flew to Haiti to pick them up. In the days ahead, Samaritan’s Purse will also place equipment on the ground in St. Martin to convert seawater into clean drinking water, which has become another urgent need. 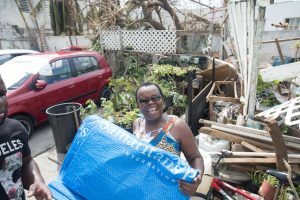 Samaritan’s Purse blue shelter plastic is being distributed in St. Martin. In addition, we’re looking to distribute food on the island of Antigua, also decimated by Irma on its deadly path through the Caribbean. Currently, the entire population of the devastated island of Barbuda has been evacuated to Antigua. So, this is a unique situation to assist the population of both islands in one place. This growth of our Caribbean response is possible because we’ve set up an operational hub on Puerto Rico, from where we can fly a DC-3 plane to smaller islands with airport access. Meanwhile, we’re ramping up our distributions to people on St. Martin, beginning on Wednesday morning. More than two dozen disaster response specialists will fan out across different neighborhoods to bring emergency supplies to thousands of families.  These hurricane relief items include blankets, hygiene kits, water purification units, and heavy-duty plastic for emergency shelter. Working with government agencies and in partnership with local churches, we will aim to prioritise the needs of the elderly and disabled. Pastor Lapaix and his family are helping their neighbours recover. On Monday, we partnered with two local churches and an orphanage to help meet physical needs and to show the love of God to those affected by Hurricane Irma’s destructive rampage. 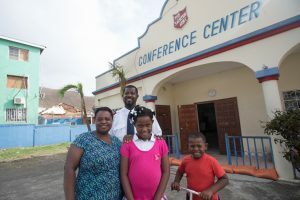 “The church doesn’t just have the responsibility of looking after the church in a time of crisis, but of looking after the whole community,” said Dones Lapaix, one of the local pastors we’ve worked with on St. Martin. Pastor Lapaix’s wife Elna said that during the hurricane she wasn’t scared because she prayed the entire time. Her neighbors could hear her praying out loud for their safety and protection. She was glad to receive relief from Samaritan’s Purse. 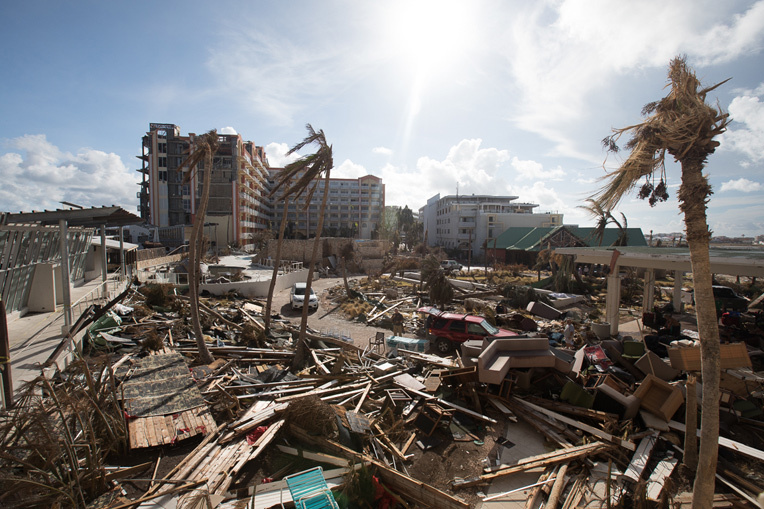 The devastation on St. Martin was extensive. Our team members report that houses upon houses were badly damaged. Roofs were blown off. Irma’s Category-5 winds lifted cars and flung them into trees. Overwhelming mounds of rubble litter each street, though bulldozers are beginning to clear them out. Please pray for our teams as they reach out to people who need hope after Hurricane Irma. Many are without jobs and are anxious about their future. Pray that we can be sensitive and meet tangible needs with grace and compassion in the Name of the Lord Jesus Christ. 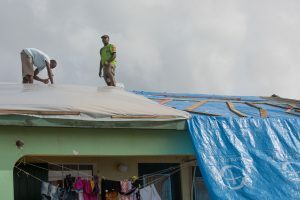 The damage on St. Martin is extensive. Follow our feed for some of the latest videos, photos, and updates from the Samaritan’s Purse Hurricane Irma response.